* The ingots are charged into the Aluminum wet well, immersed, and melted. * An AIMEL™ ( a molten Aluminum ) pump circulates the molten Aluminum and make / keep bath temperature to be uniform. * Because ofthe light weight with low density(1.6g/㎤), it can be easily handled at the operation. * Excellent thermal shock resistance. * The efficient heart insulating property keeps the temperature of molten aluminum in the ladle,　the running temperature of molten aluminum in the holding furnace doesn't need to be higher. * Because of low wet ability of the ladle to the molten aluminum, the aluminum are easily removed　from the ladle. * Aluminum finely chipped powders always generates at machining/finishing of aluminum parts. The chips rapidly melt when they are put into the vortex well of molten aluminum. * As the chips are quickly immersed into the molten aluminum at the vortex well, the chips are　inhibited from oxidation, which results effective in-house recycling with a high yield. * Immersing ingots into the molten aluminum at charging well and putting the chips into the　vortex well, these raw materials melt rapidly. The molten aluminum circulates through　chambers of the furnace. 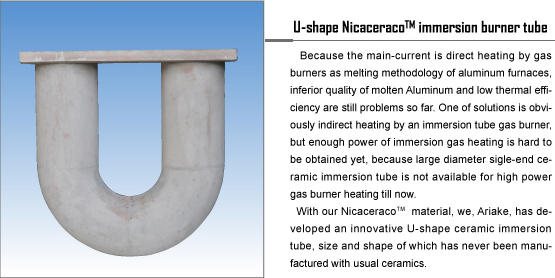 * With melting into charging & vortex wells method and with heating by immersion　NICACERACO ™ ceramic tube gas burner, generation of oxides are suppressed. 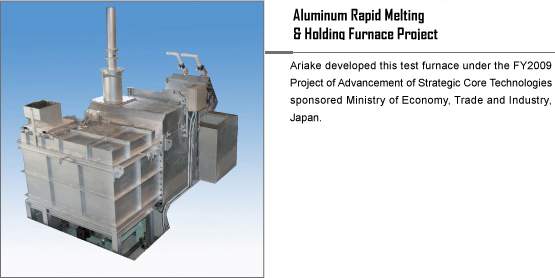 * The energy efficiency at the running of melting of aluminum and supplying of the molten aluminum is about 47% and superior to that of typical conventional melting and holding furnaces.